This vintage black brushed cotton shirt is 100% cotton and was made in Hong Kong. The tag says it's size 8, but it fits like a size 4. 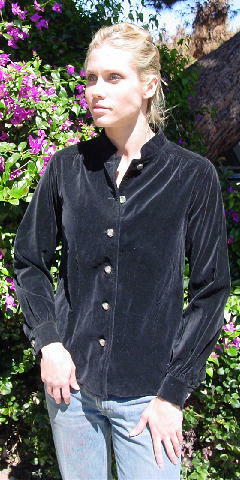 It has a mandarin style 1 1/2" wide collar and long sleeves with one button cuffs and 3" long plackets. 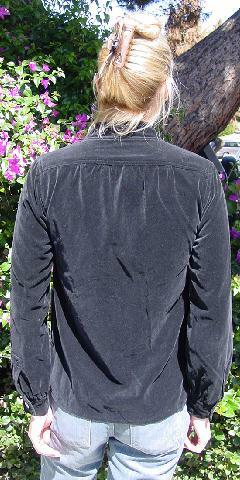 There are 2 side seam 4" slits and 2 half moon shaped pockets which open by the side seams. It has six buttons down the front. 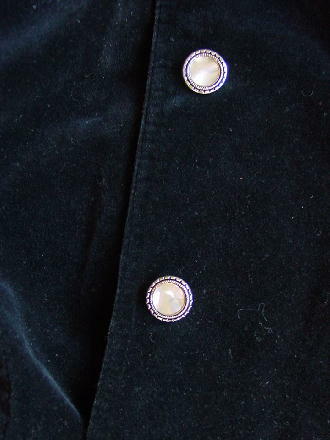 All the buttons have pearlized centers and are surrounded by two silver-tone ring patterns. There is a back yoke that extends to the front, and it has gathering extending downward (front and back) from the yoke. She grew out of it. shoulder to hem 23 3/4"